Last week, copyright guru Lawrence Lessig‘s Change Congress organization, which hopes to reduce the influence of money in politics, accused Sen. Ben Nelson (D-Neb.) of undermining Americans’ faith in politics by creating the appearance of corruption. As I wrote last week, Nelson seemed to take the criticism both seriously and personally, lashing out in a defensive press release. But Change Congress hasn’t let up. This week, the non-profit launched an internet ad targeted at Nebraskans (you can see an image of the ad to the left) but this effort isn’t nearly as effective as the mailer. Congress’ first attacks on Nelson were potent because they were harsh and they zeroed in on the issue of corruption. 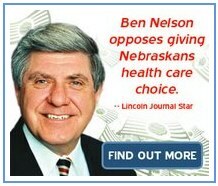 The original mailer asked whether Nelson would “sell out Nebraska for $2 million?” That directness has prompted politicians to respond to CC’s attacks, often emotionally. It’s the responses that will draw the most media attention to Lessig’s cause. The new ad also runs the risk of pigeonholing campaign-finance reform as a liberal cause, not a public good. Government-run health insurance is a great idea, but it’s also a liberal one. Next time, the organization would do well to highlight an issue that isn’t identified so closely with the left. If Lessig really wants to change congress, he and his supporters need to convince everyday conservatives that money in politics hurts them, too.